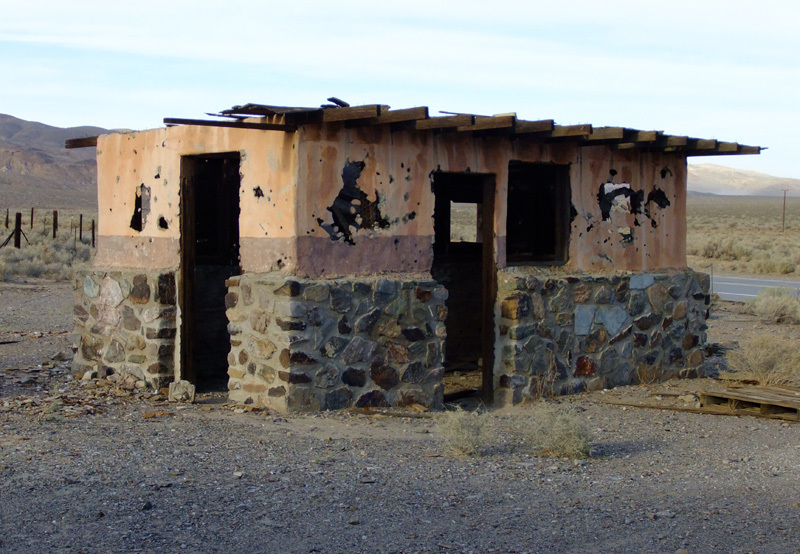 April 13, 2013  Abandoned structure(s) at Garlock. 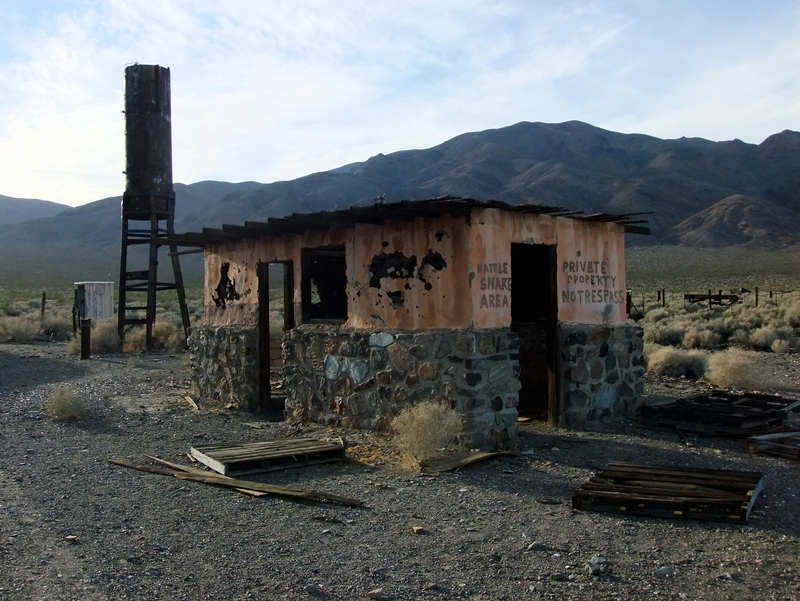 The tiny ghost town of Garlock is located on Garlock Road, just off of the Redrock-Randsburg Road, about 40 miles northeast of Mojave and 7.5 miles west of Highway 395 (see map). For a short time at the turn of the 20th Century, Garlock crushed ore from the Yellow Aster gold mine at Randsburg, nine miles distant. In 1896, Eugene Garlock constructed a stamp mill near this spot to crush gold ore from the Yellow Aster Mine on Rand Mountain. Known originally as Cow Wells by prospectors and freighters during the 1880s and early 1890s, the town of Garlock continued to thrive until 1898, when water was piped from here to Randsburg and the Kramer-Randsburg rail line was completed. "The new eight stamp mill of Eugene T. Garlock, at Eugeneville, near Goler, under the supervisor of Mr. Lovejoy, the contractor, is rapidly being built. The building proper is 50 x 75, with other additions adjoining. The concentrator and sulphuret rooms are completed and ready to receive their machinery. The large battery blocks are all framed and will be placed in the battery pit in a day or two. The ore bins are about completed and will hold 600 tons. The stamps weigh 900 pounds each, which is a sufficient weight to do good work, in crushing the rock of that district. Mr. Garlock informed your correspondent that he expected to have the mill completed by the first of March. There is not the slightest doubt but what twenty-five more stamps will be added next year, as the Randsburg company alone have enough ore in sight to keep a 100 stamp mill running steadily for the next fifty years. This is a fact. With the completion of the mill, Eugeneville will become one of the best mining camps in the State." Several hundred people are said to have resided in Garlock during its short-lived heyday. By 1903, after a stamp mill was erected at Randsburg, rendering Mr. Garlock's mill all but obsolete, most of them had left. Small amounts of ore continued to be processed at Garlock until 1907, when Eugene Garlock died. LW2366b: 9600 dpi jpeg from digital image by Leon Worden.